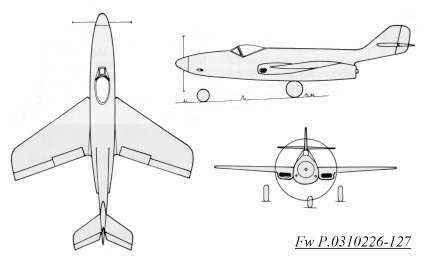 This Focke-Wulf design was powered by a He S 021 turboprop, located within the fuselage just behind the cockpit. The jet engine was fed by two air intakes located in each wing root. The wing was swept back 31 degrees and was mounted mid-fuselage, and the tail planes were also swept back. A tricycle landing gear arrangement was fitted. Armament was to be a single MK 103 30mm cannon firing through the propeller hub and two MG 213 20mm cannon in the lower forward fuselage.